There are numerous law enforcement agencies that patrol the roads in Maryland. Typically the local cops will stick to the side streets, while the state police and the transportation authority police will work the highways and interstates. But it also a little known fact that the federal government has its own team of law enforcement out on a few of these highways as well, and when these cops write a citation or make an arrest the case will be tried in federal court. The United States Park Police is responsible for patrolling the Baltimore Washington Parkway, also known as 295, and the Clara Barton Parkway. Both of these highways are major thoroughfares, which are traveled by thousands each day. 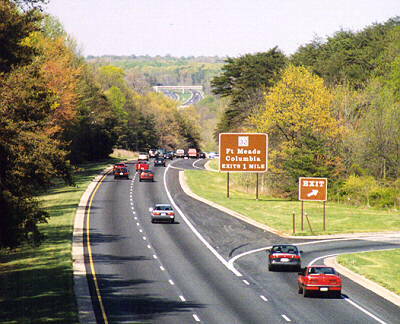 The BW Parkway is a 32-mile stretch of highway that connects downtown Baltimore with Washington D.C., and runs through major suburban areas such as Greenbelt and Bladensburg in Prince George’s County, and Glenn Burnie and Odenton in Anne Arundel County. The Clara Barton Parkway is a 7-mile road that runs along the Potomac area of Montgomery County. Neither of these highways allows trucks and they known for their tree lined appearance. But the two roads have numerous drawbacks including traffic, low speed limits, and the abundance of police. The BW has a 55 MPH speed limit, while the Barton’s limit goes as low as 35 MPH. The U.S. Park Police write hundreds of speeding tickets with large fines each year on theses roads, but they also make numerous arrests for more serious traffic offenses such as DUI and driving on suspended or revoked licenses. Unfortunately they have become increasingly aggressive when it comes to investigations and arrests involving the suspicion of drugs and or alcohol, and for this reason there are a large amount of illegal and unlawful detentions and searches. If you have been arrested or cited by the Park Police do not walk into court without an experienced federal traffic lawyer! The stakes are simply too high in to gamble with your freedom. Under federal law a DUI is a misdemeanor with a maximum jail sentence of 6 months. While this is similar to Maryland state law, keep in mind that there is no probation before judgment or PBJ in federal court, and cases cannot be expunged. This is why it is important to avoid a conviction at all costs. Any jail sentence will take place in a federal jail, and likewise a probation sentence will result in supervision by a U.S. probation officer. Home detention is a common sentence provision as well, and while it is better than jail it is still something we will fight to avoid. Traffic citations issued by the Park Police will either be sent to the United States District Court in Baltimore City or in Greenbelt, and are typically handled by a magistrate judge. Magistrate judges are appointed to eight year terms, in contrast to district court judges that may serve for life. The Herbst Firm handles traffic cases in both courthouses and specializes in DUI defense. Benjamin Herbst understands the stakes, and knows what it takes achieve the best possible outcome in your case. He is available 24 hours a day and is more than willing to travel to meet with you wherever is convenient. The United States Park Police may try to violate your rights during traffic investigation, and will arrest and charge you even if the evidence is lacking. But you can fight back by hiring the right attorney to get you through this situation. Begin your fight by calling us today for a free consultation about your case.